The PKK terrorist organization's Syrian affiliate, the Democratic Union Party (PYD), is continuing to carry out its aim of changing the demographics in northern Syria by forcing Arab and Turkmen populations to migrate, while also oppressing Kurds who don't share the same political ideology as them. Some of the Syrians who escaped from Syria's PYD-held Tal Abyad now live in Turkey's southeastern Şanlıurfa province, which is host to nearly 500,000 refugees. Halil Abbut, a 65-year-old of Arab origin, is one of those hundreds of people who were forced by the PYD to migrate to Akçakale, a border district in southeastern Şanlıurfa province, over two years ago. "The PYD seized our homes and gave them to the Kurds who were brought in from Iraq, Iran and other parts of Syria," Abbud told Anadolu Agency reporters. "Before the PYD's arrival, the majority of the people living in the town were Arabs." The PYD's forced migration of Arabs and Turkmens, as well as arbitrary arrests against critical voices and recruitment of child soldiers, have also been covered by the international human rights groups, including the Human Rights Watch, Amnesty International and KurdsWatch. The United States has chosen the Syrian Democratic Forces (SDF), which is predominantly led by the People's Protection Units (YPG), as its partner against the Daesh terror group. Tal Abyad was also seized from Daesh through support from U.S.-led coalition airstrikes in 2015, which was followed by the forced relocation of Arab and Turkmen locals. The U.S.'s military support for the PYD has been heavily criticized by Turkey, which sees no difference between the PKK and PYD. Turkey has long argued that the military support given to the PYD will ultimately be used against Turkey. As such, the PYD's existence in northern Syria has been considered a national security threat. Ali Bakeer, an expert on Middle East affairs, told Daily Sabah that such forced migration by the PYD is a result of its aim of controlling the whole of northern Syria and ultimately seeking an opening to the Mediterranean Sea. "In order for the PYD to control the whole north of Syria and seek an opening to the Mediterranean Sea as they declared two days ago, they necessarily need to change the demography of the region to control more land. This is exactly what they have been doing in the last few years. It is normal for these forces to operate with the same mentality as that of the Syrian regime. They have the ability to oppress others, change demography, control more land and they are doing it because they can and because they have unprecedented support from the United States," Bakeer said. "There are major complaints against the PYD even from the Syrian Kurds. In March alone, the PYD closed 44 headquarters and offices belonging to organizations, civil society movements, women and youth unions, and Kurdish and Assyrian political parties in three days," he said. 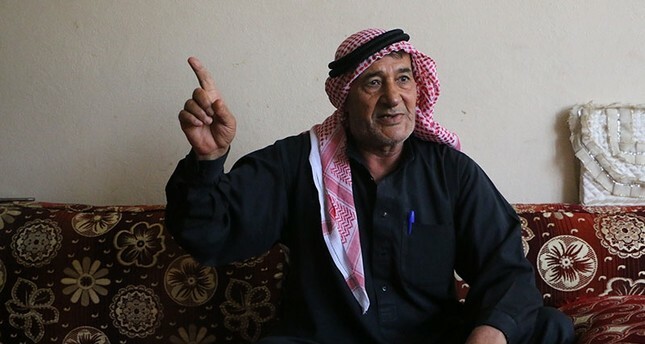 Last year, PYD forces abducted Ibrahim Biro, the chairman of the Syrian Kurdish National Council (ENKS), in the city center of al-Qamishli, and then forced him to leave the country, threatening to cut him into pieces if he returned. "How is that different in any way from what Daesh, Iranian forces or the Assad regime is doing? And if they are dealing with a Kurdish leader in such a manner, you can imagine very well the way they deal with others," he added. The PYD kidnapped Biro in August last year near Syria's border with Turkey. Biro was later released after being held for six hours at a PYD camp on the Turkish-Syrian border. Reports had said that Biro and a member of the Kurdistan Democratic Party of Syria (PDKS), Suleyman Oso, were kidnapped by the PYD in Syria's Al-Hasakah Governorate after a conference they were attending. The PYD has kidnapped Kurdish politicians and figures who criticized them for a number of reasons, in addition to collecting ransom from businesses. The ENKS is a coalition of 12 Syrian Kurdish parties and known to oppose the PYD after the group became more dominant in northern Syria. The PDKS in the Syrian branch of Iraq's Kurdistan Regional Government's (KRG) ruling party, led by Masoud Barzani. Meanwhile, the Syrian refugee, Abbut, also said the locals do not see a difference between the PYD and the PKK terror organization, likewise Ankara considers the PYD a terror group. "They are no different from the PKK terrorist organization. We don't want terror organizations on our soil. No matter what the cost, we will not surrender it to terror organizations," he said. Kyle W. Orton, a Middle East analyst with the Henry Jackson Society, said in a recent article titled, "PKK and Propaganda," that the SDF is a guise to legitimize the U.S.'s support to the PKK. "The SDF is a front-group for the PKK, mostly designed to assist the United States in circumventing her terrorism laws since the PKK is blacklisted; the PKK is also registered as a terrorist organization by Turkey, the European Union, and NATO. The SDF has some Arab units attached to it, but this multi-ethnic composition is not allowed to threaten the PKK's political monopoly within the SDF," Orton said. "The removal of civilians from combat areas is a laudable military practice; the evidence is, however, that the PYD is not allowing inhabitants to return afterwards and this does seem to be strongly ethnically biased, with Arabs and Turkmen excluded," Orton told Daily Sabah in a separate inquiry. The PYD's oppression against rival political voices, including burning down their offices, arresting or kidnapping members, has been voiced as a concern by northern Syrian Kurds. The Kurdish National Council in Syria (KNC) has been a critical voice against the arrests and abductions carried out by the PYD, including a claim that the PYD is working with the Assad regime. "The more important restructuring by the PYD is political, with military and civilian councils being formed in PYD-held areas that are often ethnically diverse but wholly under the political control of the PYD. Complaints from Kurdish opposition groups about the PYD's behavior are getting more frequent and understandably so. The PYD has now passed a law that essentially makes Rojava formally a one-party state, and the PYD's repression of all other Kurdish groups in Syria is very severe. The offices of the Kurdish opposition are regularly attacked, and Kurdish dissidents are beaten up, arrested, expelled, and in extreme cases killed by the PYD's security apparatus," Orton added.